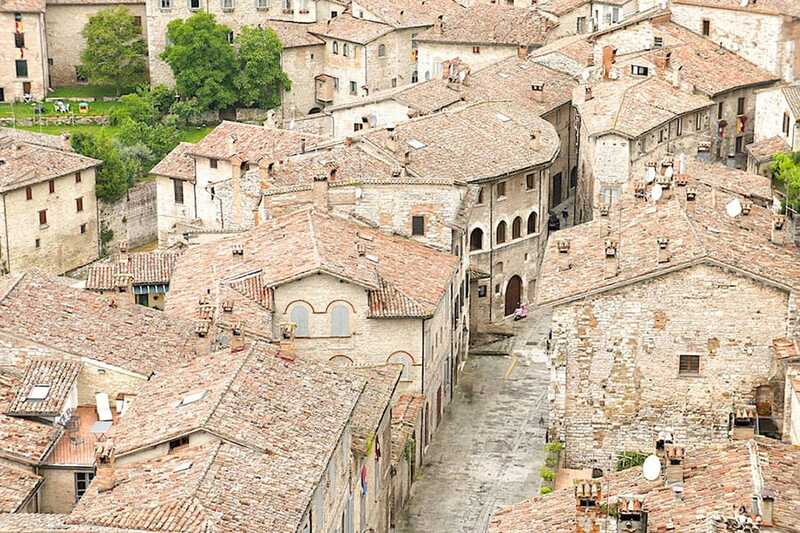 Cortona is set in a central location at the very heart of Italy. In its immediate surroundings there are places rich in history, castles and medieval villages, in addition to enchanting itineraries for lovely long walks. From here one can easily and quickly reach the most beautiful and most interesting cities for their history, culture, food and wine in Umbria and Tuscany. Many of these tourist destinations can be easily reached by train from the train stations of Camucia-Cortona or Terontola. 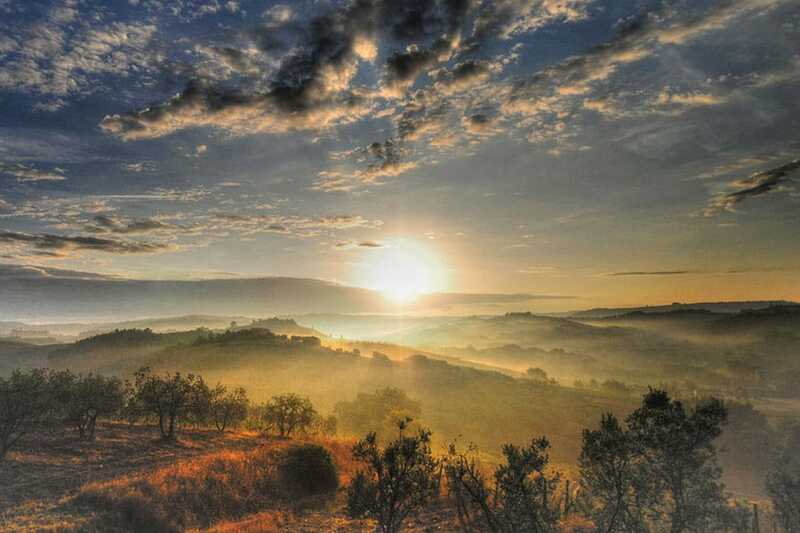 Arezzo dominates a beautiful valley where Valtiberina, Valdichiana, Casentino and Valdarno all join together. As evidenced by its architecture, Arezzo boasts an ancient origin as it was one of the main Etruscan towns and then a significant Roman town. The upper part of the city, dominated by the Cathedral and the Medicean Fortress, maintains a visible medieval character. The Cathedral, showing Gothic features, preserves valuable works of art among which we find The Mary Magdalene by Piero della Francesca and decorated glass windows by Guillaume de Marcillat. Piazza Grande, characterized by many different styles, is the real heart of the town. In this beautiful framework an equestrian tournament of medieval origin called Giostra del Saracino takes place on the penultimate Saturday of June and the first Sunday of September. The square and a big part of the city center host an Antiques Fair on the first Sunday of every month and on the previous Saturday. Many world-famous people were born in Arezzo such as Caio Cilnio Mecenate, Francesco Petrarca, Giorgio Vasari, Francesco Redi, and Guido d’Arezzo or Aretino. A beautiful medieval village situated on a hill foot between stream Sovara and the Tiber valley. At the heart of its historic center you can see Palazzo Taglieschi, seat of the State Museum where valuable art works are preserved (a Virgin Mary in polychrome wood by Jacopo della Quercia, terracotta works by Della Robbia and a still working table organ dating back to the 16th century). During the spring time, the narrow streets of the old town are crowded with tourists and the shops open their doors to visitors who, every year, don’t miss the chance to attend the traditional Market and Exhibition of Handicrafts and of Tuscan Tiber Valley. The medieval town of Siena is located South-West of Arezzo on the border with Chianti shire and it is one of the most fascinating towns in Tuscany from the artistic and architectural points of view. Squares, streets, monuments, and museums tell today its glorious past. The Cathedral and Piazza del Campo with its Tower of Mangia are among the most famous buildings. 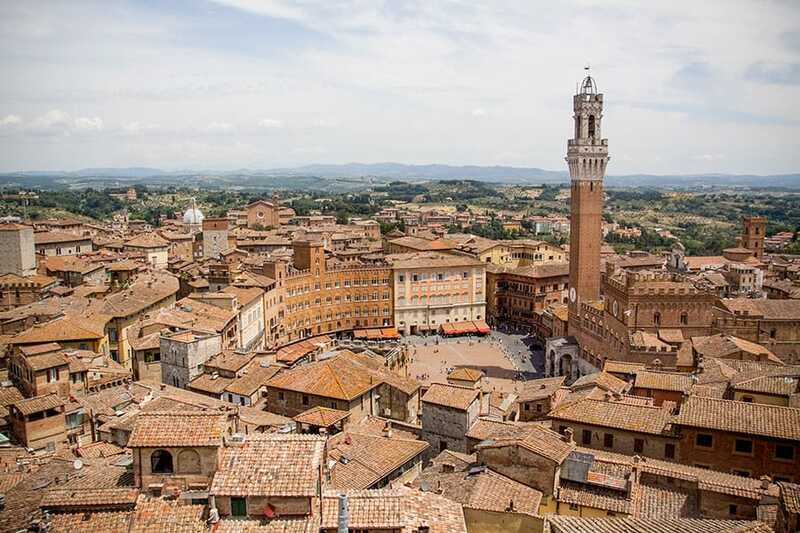 Siena is divided into quarters called “contrade” and its inhabitants compete every year on Piazza del Campo for winning a coveted trophy. Siena is the town of the Palio delle Contrade, the most famous and most deeply heartfelt popular event in Italy; this both religious and civil feast characterised by a spectacular show, combining a cultural historic reenactment and a hectic horse race that reveals the pride and competitive spirit of the Contrade, is held on 2nd July and 16th August. 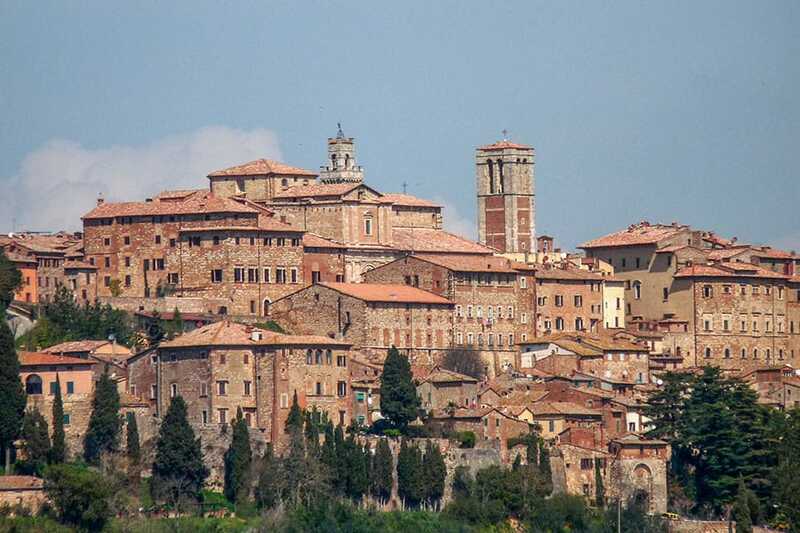 Montepulciano is the highest of the Tuscan hill towns and offers fine examples of Renaissance architecture surrounded by defensive city walls. Montepulciano is known as the “pearl of the 15th century” where you can admire many famous buildings such as the Cathedral, the Loggia del Mercato, the Avignonese and Tarugi palaces and also the Bucelli Palace with burial urns and Etruscan and Latin inscriptions. 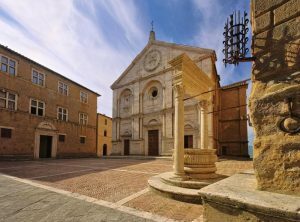 Other places of interest to visit in Montepulciano are the Church of Saint Agnes, the patron saint of the town, and the Civic Museum. Montepulciano is also world-famous for its excellent Vino Nobile and other typical Tuscan products. Apart from the magnificence of its Renaissance palaces and the elegant beauty of its churches, this village is mainly renowned for wine, namely “Vino Nobile”, one of the most appreciated Tuscan wines at the international level. Pienza, a little jewel of the Renaissance at the very heart of Tuscany, within the province of Siena, owes much of its beautiful architecture to Pope Pius II who, between 1459 and 1462, called Bernardo Rossellino, one of the most famous architects at that time, to work in Pienza with the aim of transforming his hometown into a marvelous Renaissance town, a unique example of architecture and town planning of the 15th century; tidy and rational, this place offers incredible views onto the landscapes of Val d’Orcia, as if they were painted by the best painters of the Renaissance. Particularly interesting monuments in Pienza are the Cathedral, the Palazzo Piccolomini and the Diocesan Museum, where works by Sodoma and a number of magnificent Flemish tapestries by the 15th and the 16th century are collected. Pienza is famous for its production of sheep cheese produced in the countryside of the Val d’Orcia amid its ravines and its rolling hills, the so-called “Crete”, and seasoned in a variety of different flavors ranging from walnut leaves and vinasse to pit seasoning. Montalcino and its imposing fortress of the 14th century are perched on a hilltop at 567 m AMSL and overlook the whole surrounding countryside. The Town Hall, the Cathedral and the churches of S. Agostino, S. Egidio and S. Francesco are not to be missed. In the Archaeological Museum you may see a number of interesting prehistorical and Etruscan finds from the area whilst in the Museo Civico you may see two terracotta works by Andrea della Robbia. 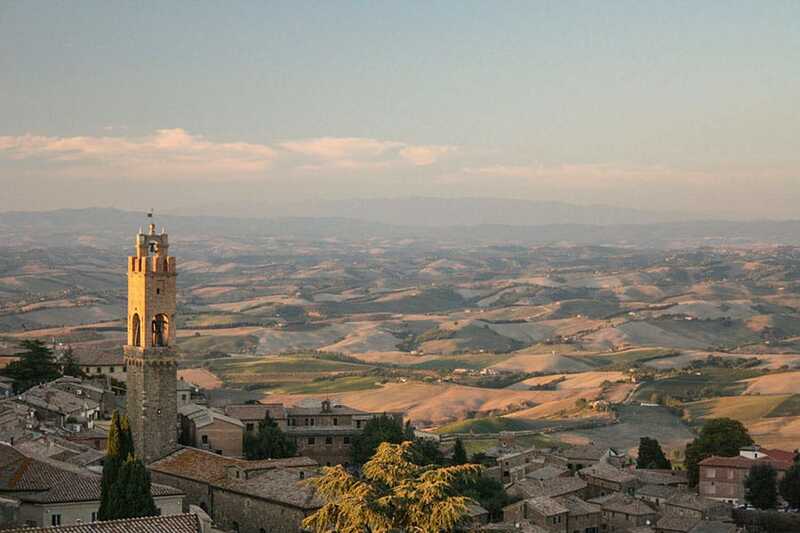 Montalcino is, above all, the home to one of Italy’s and Tuscany’s most important red wines: the Brunello di Montalcino. It is made from pure Sangiovese vines grown in the nearby hills and it is one of the best expressions of a territory and a landscape that are the very heart of Tuscany. Right outside the town, in the village called Castelnuovo dell’Abate, in the Starcia valley, we find the Romanesque abbey of Sant’Antimo, a cozy and impressive temple surrounded by an almost enchanted atmosphere, which was founded by Charlemagne in 781. 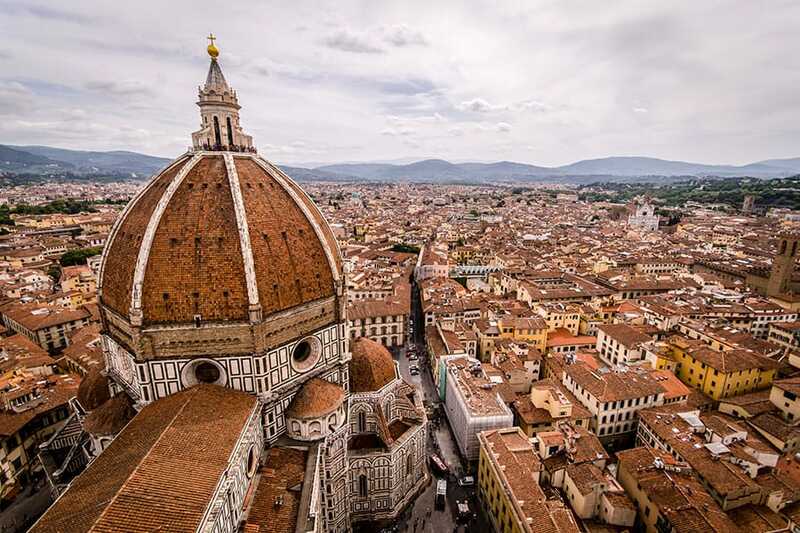 Florence, the capital of Tuscany that is world renowned as the art city par excellence, is almost in the center of Tuscany and Italy, and it is one of the most important cities for art, architecture, culture, commerce and industry. Thanks to its central location, it can be easily reached by train and many other important towns are driving distance. Florence began its rebirth after the decadence of the Barbaric ages and reached its highest splendor between the 11th and the 15th century, as a free city. Then it came under the rule of the Medici Family, who later became the Grand Dukes of Tuscany. This in fact happened when the city was at the height of its glory in art and culture, in politics and economic power. Italian painters Cimabue and Giotto, the innovators of the Renaissance Brunelleschi and Donatello, and universal men like Leonardo and Michelangelo lived here. This Tuscan city offers a thousand beautiful places to visit and discover, such as the Uffizi Gallery, the most prestigious art gallery in the world, the sculptures by Michelangelo, the Medicean Chapel, the Cathedral of Santa Maria del Fiore with its Belfry designed by Giotto, the Baptistery, the Bargello Museum and the Gallery of the Academy. The Chianti is a historic-geographic region that gives evidence of Tuscan peasant civilization, whose territory extends towards the Southern part of the province of Florence and the Northern part of the province of Siena. This hilly region is characterized by rocky soils with a thin layer of fertile earth on top, where vines, olive trees and vegetables, in addition to forests, are miraculously grown. This geographic region has a significant history because it was long disputed between Siena and Arezzo and between Florence and Siena, a land of saints and soldiers, of great artists, of farmers and lords, a land where one of the most renowned Italian wines started being produced about five centuries ago. 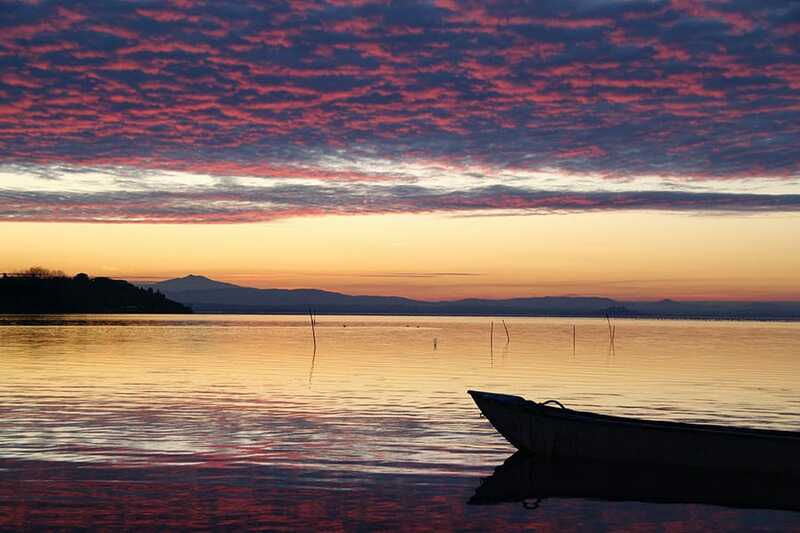 Lake Trasimene, in Umbria, with an area of 128 km² is the forth biggest lake in Italy, and is famous for the Battle of Lake Trasimene, which was fought along its sides in 217 B.C. and saw the victory of the Punic army led by Hannibal over the roman army led by consul Gaius Flaminius. The fish stock of this lake is very rich. The main species are: pikes, carps, trench, chubs, eels, perches and Crucian carps. There are three islands in the lake: Polvese, Maggiore and Minore. 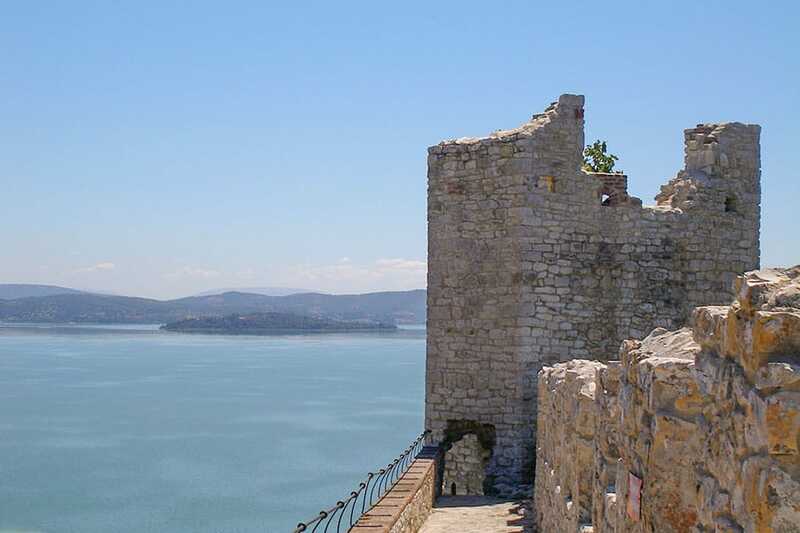 The town of Castiglione del Lago rises on a promontory that once formed the fourth island of Lake Trasimeno, the fourth largest lake in Italy. The area of Trasimene is very pretty, there are boat trips in the summer to visit the three islands or to cross the lake from one side to the other. The best beaches are situated near Castiglione del Lago, a lovely Etruscan town, where the medieval walls and the ancient castle are still well preserved. 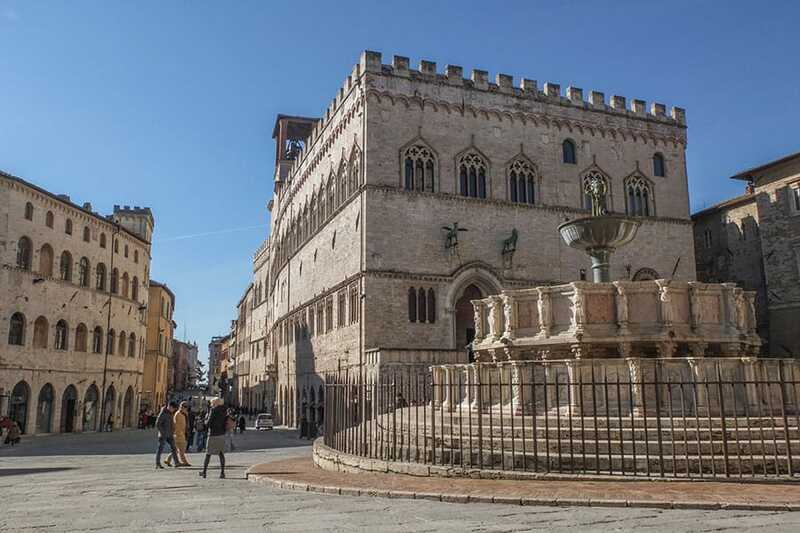 Perugia, the great “Arce Guelfa” rises in the center of Umbria, with its 5 historic quarters surrounded by Etruscan walls: huge bastions consist of enormous squared rocks that were put in place 22 centuries ago and are still visible for long stretches. When Rome was a little more than a campsite of huts, there were 7 gateways in Perugia through which one could enter the town. The most imposing one was certainly Porta Pulchra or Porta d’Augusto. 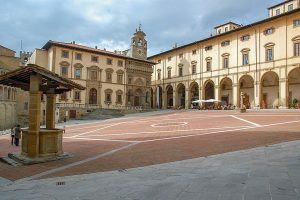 The main square is embellished with the Cathedral of San Lorenzo, the Fontana Maggiore and Palazzo dei Priori, which today hosts town hall offices and the National Gallery of Umbria, one of the most important art galleries of central Italy where masterpieces such as the Polyptych of Saint Anthony painted by Piero della Francesca and works of Perugino and Pinturicchio are on display. The Collegio della Mercanzia, located on Corso Vannucci next to the Palazzo dei Priori, and the Collegio del Cambio, located in the same building, are the town’s medieval money exchange offices and their walls were superbly frescoed by Perugino. At the Southern end of Corso Vannucci you can see the Giardini Carducci from where one can enjoy excellent views of the surrounding countryside. Underneath the gardens you find Rocca Paolina, a 16th century fortress: destroyed after Italian Unification, the ruins remain a symbol of defiance against oppression. Assisi, the most enchanting and spiritual town in Umbria and core of global religiousness, lies at the foot of Mount Subasio. Founded by the Etruscans and later dominated by the Romans, the town is the birthplace of Saint Francis, Patron Saint of Italy. 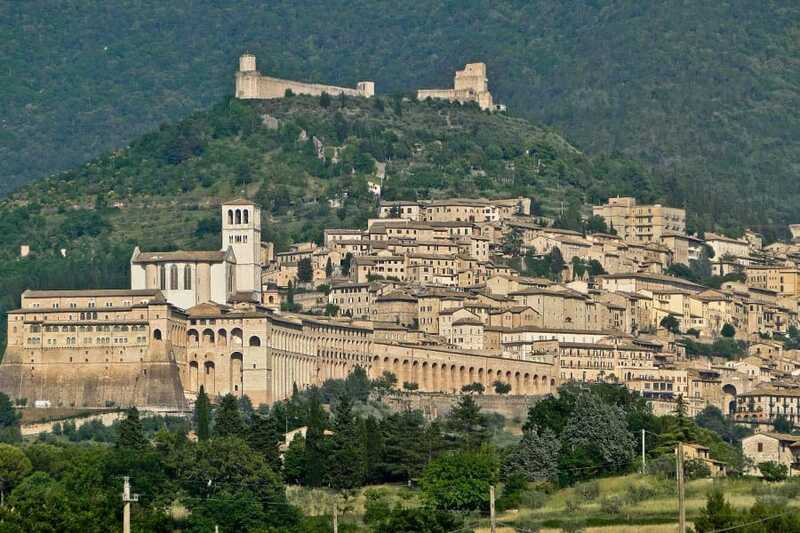 The main attraction of Assisi is the Basilica of Saint Francis. It consists of two churches. The upper one was built between 1228 and 1230 and is embellished with frescoes on Saint Francis’ life made by Giotto and Cimabue; the lower one was built between 1230 and 1253. The entrance to the basilica dates back to the 15th century. Attached to the Basilica is the Franciscan monastery founded by Saint Francis in 1206. Another magnificent example of Gothic architecture: the Church of Santa Chiara where you can see the crucifix that spoke to Saint Francis according to tradition. 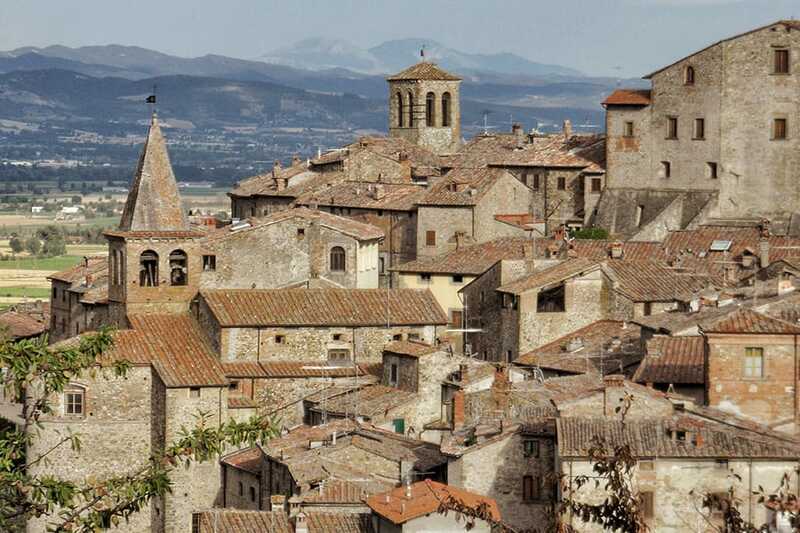 Although Gubbio has a Roman origin, it has a medieval appearance that is typical of villages and towns in the North of Umbria, it is perfectly preserved and is rich of monuments giving evidence of its glorious past. The place to start a tour of Gubbio is Piazza Quaranta Martiri, named after forty citizens shot by the Nazis in 1944. Here you can visit the Cathedral of the 13th century, which is an admirable example of Gothic architecture. Other important monuments in Gubbio are the Plazzo Ducale, the Palazzo dei Consoli and the Roman Theater, a perfectly preserved 1st century amphitheater located at the foot of the town. It is famous for local manufactures, mainly pottery, and for its medieval traditions like the famous Procession of the Candles that has been held on 15th May every year for centuries, the day before its patron Saint Ubald, who died in 1160, is celebrated. The Candles are enormous timber structures weighing about four hundred kilos each, topped with statues of Saint Ubald, Saint George and Saint Anthony, carried on shoulders along the picturesque streets of the old town up to the top of Mount Ingino, where the basilica dedicated to the patron saint is located.